I used to dread sending website mockups to clients. I knew there would be changes. Every time I sent a mockup I held my breath. And every time I saw the client had responded it to it… I held it longer. I didn’t want to start an endless revision cycle until my hair turned gray and I needed a walker. Because it happened every time. Until, I changed the way I presented my work. 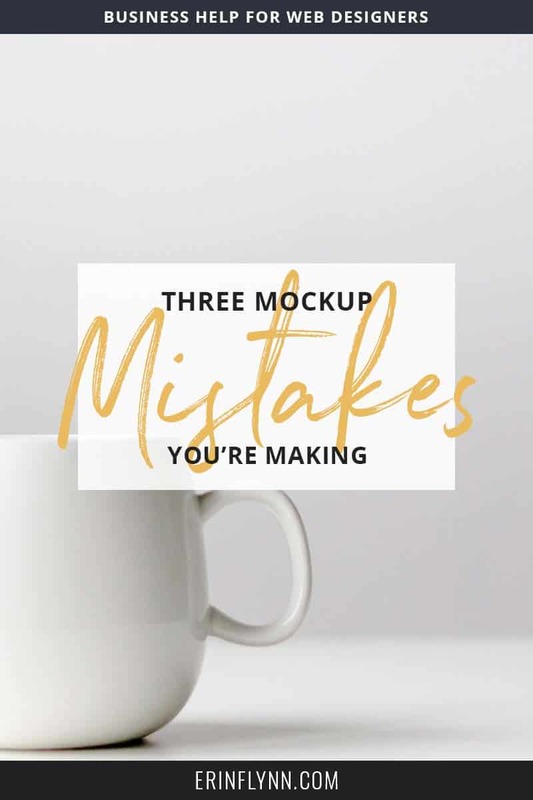 For the first few years of my business, I did what most web designers did, I made a mockup in a graphics program, and sent it over to my clients to review. But I was making three HUGE mistakes. You know the web design process. Wireframe, mockup, then code. We used to do that in the old days because we used to have to code—a LOT. So having the wireframe and then the design nailed down before coding started saved us from having to code and re-code again and again. But this process doesn’t make sense today. With modern technology like WordPress, Squarespace, and Showit, it hardly takes ANY longer just build the website, than it does to design it in a graphics program. Plus, your client’s don’t “get” a static mockup. Nothing clicks, nothing moves, and nothing works. It’s a pretty picture, but they can’t picture it as a functioning site. So they have question after question about how things are supposed to work. And yes, there are apps that let you upload your mockups and add in links to make it more like a functioning website—but why spend that time when in the same amount of time you could have made a REAL website? Static mockups are outdated, take more time, result in more revisions, and your clients don’t understand them. So all those websites where I made a mockup and dreaded sending it to the client? It’s because I didn’t realize that I needed to present my work in a way that explained my decisions to my clients. I used to just throw the mockup in their direction, and leave them to say what they liked or didn’t like and figure out everything on their own. So of course they had issues. They didn’t understand why I chose the images I chose, or arranged things the way I did on the page. But all of that changed when I started recording short videos where I walked the client through the design and explained why I did things a certain way. As soon as I started doing this, my revisions dropped significantly. In fact, I hardly EVER have more than one or two tweaks now, and they’re not normally about the design, but a client changing their mind on a small aspect to better fit their goals for the website. When you walk clients through your decisions, they trust you and they understand why you made the decisions you did with their design, so they don’t ask you to make many changes–of any at all. Remember when I was holding my breath? A big part of that was because I never knew what to expect in terms of feedback from my clients. Would they ask me to make the blue bluer? Would they ask me to make the logo bigger? Would they send 45 separate emails with conflicting changes that I would have to weed through? The problem is, most people don’t know how to give useful feedback, so you have to tell them. Around the same time I started presenting my work via a video recording, I also started creating feedback guidelines for my clients. Inside these guidelines I did things like ask them to keep their goals, and their audience in mind. As well as not crowdsource feedback from random people or Facebook groups. I asked specific questions about the design, and what they liked and didn’t, always referencing back to what they wanted their website to do. And most people want their website to bring in more leads, make them more money, or save them more time. Between explaining why I designed the way I did, and guiding the feedback so that the client’s goal was always front-and-center, I not only got useful feedback that I could use to improve the design, but got it all in one place at one time, so that I wasn’t trying to decipher 45 contradictory emails. And again, revisions went way down, because the focus wasn’t on how blue the blue was, or how big the logo was, but whether or not the design achieved what the client wanted it to achieve. Sending your designs to your clients doesn’t have to stress you out. It can actually be a fun and enjoyable experience for both of you! Don’t send static mockups–with modern technology you can create a functioning site in the same amount of time as you can a static graphic. So skip that step and send something your clients understand. Present your work like an expert–don’t leave clients to figure out why you did something, create a video walk-through and show them why you designed the way you did and how it helps them achieve their goals. Your revision cycles will drop drastically. Guide your client’s feedback–remember to have them focus on their goals and their audience, and whether your design achieves their goals. Ask specific questions that you can use to make improvements to the design. Making these changes will reduce your revisions, organize your feedback, and make you look like a total pro. Need help? This is just a tiny section of what I teach in Streamline Design Profit. Learn how to present your work and guide feedback from your clients with video script templates, feedback guidelines and questions, and a whole lot more! Check it out!